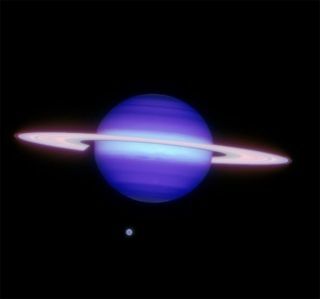 Gemini North infrared image of Saturn and Titan (at about 6 o'clock position), obtained on May 7, 2009. A tropical storm was not what astronomers expected to seewhen they pointed their telescopes toward the equator of Saturn's moon Titanlast summer. But that's exactly what they found on this beguiling moon,home to a weather system both eerilyfamiliar and perplexingly strange. Thediscovery was announced today. In many ways Titan's climate resembles that of Earth, butinstead of a water cycle, Titan has a methane cycle. Clouds, rainand lakes all exist on Titan, but they are all made of methane. In themoon's frigidclimate, any water is frozen into rock-hard ice. Clouds of vaporized methane are not uncommon on Titan,though they have never before been observed in Titan's tropics. But in April2008, astronomers using the Gemini North telescope and NASA's InfraredTelescope Facility in Hawaii spotted a severe storm covering 1.2 million squaremiles (3 million square kilometers) over the equator. "The models predicted that the equatorial region shouldbe very dry and should not support cloud formation," said astronomer HenryRoe of Lowell Observatory in Arizona. "But this episode created cloudsover both the equator and the south pole. We don't know what set off thatsequence, but something gave a pretty good kick to the atmosphere." Scientists suspect the storm's trigger may have been somekind of geologic activity on the moon's surface, such as a geyser or newmountain range forming. Atmospheric effects may also have set off the storm. Whatever the cause, once the clouds were established theyseem to have spread throughout Titan's atmosphere in waves. The situation is a new wrinkle in the study of this complexmoon. "It's an amazing place because it is deeply familiar tous, being from Earth, in terms of the processes - clouds forming, rainfall,carved out channels on the surface, huge fields of what look like sanddunes," Roe told SPACE.com. "But the materials that are involved arequite alien." Scientists hope to learn more as Saturn's 30-year-long orbitplays out a full rotation of seasons on the moon. NASA's Cassini spacecraft iscurrently in orbit around Saturn, but it only flies by Titan once every sixweeks or so. In the meantime, ground-based telescopes can keep a near-steadyeye on the moon. "We really need to keep observing Titan in detail formany more years in order to get a true understanding of how its seasonschange," Roe said. The researchers, led by Emily Schaller of the Institute forAstronomy in Hawaii (now at the University of Arizona), detail the new findingin the August 13 issue of the journal Nature. Editor's Note: This story was updated to correct the areameasurement of the storm.